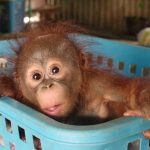 For the last few months, as fires burn all over Indonesia, the air has been thick with smoke at the Orangutan Care Center and Quarantine facility in Kalimantan, the Indonesian part of Borneo. There is no relief! The haze stays for the whole day although it may lessen a bit in the cool of the late afternoon. But it hardly makes a difference. It is often hard to see down the road or across the field beside the OCCQ buildings because of the constant presence of smoke. All of us here, including the local staff, veterinarians,western volunteers, Dr. Biruté Mary Galdikas, and myself, greatly feel the effects of these large fires.We cough, our chests tighten and we literally have trouble breathing. A few of the westerners are beginning to use asthma inhalers while some locals wear masks. 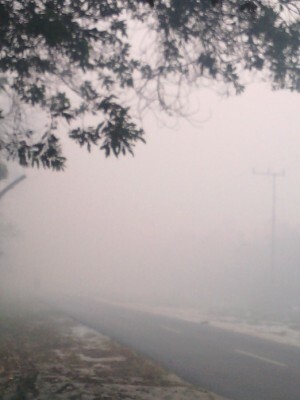 The smoke created by the fires also affects orangutans both directly and indirectly. 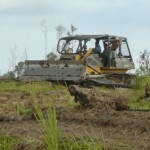 Since most of the staff are occupied fighting various fires on OFI land and in the National Park, the Care Center is not its usual bustling self. Even the orangutans seem to understand that there is an emergency going on. The usual squabbling around food or enrichment items has lessened. Fires have burned in several protected forests as well as Tanjung Puting National Park over the last two months. The OCCQ field staff have been reassigned to become OFI’s fire-fighting team. This goes for any able bodied man. The staff that remains at the OCCQ have rallied to help fill the gaps left by the newly assigned fire-fighters. 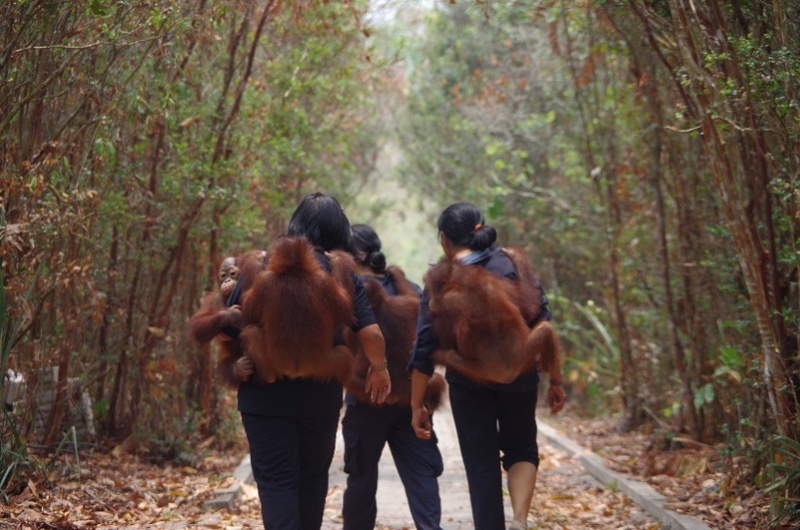 It is a great testament to the dedication of the staff to see them making extra efforts to help prepare food, clean sleeping enclosures, and provide additional enrichment to the orangutans. Many assistants have not taken days off in weeks to ensure that there is enough staff to care for the animals. Each morning, OFI staff helps prepare extra food, water, and supplies for those who go to the different fire locations that day. Staff in the kitchen help pack lunches and make coffee in preparation for the long day the fire-fighting team is going to endure. Once loaded with staff and supplies, the pickup trucks drive away and the silence sets in. 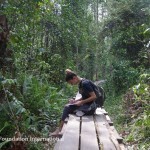 The facilities that have enough remaining staff to conduct daily release of the orangutans continue to do so. The infants go out each day to the quiet, smoky forest and are monitored very carefully for detrimental signs of smoke inhalation. 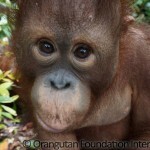 So far we have been fortunate in that no orangutans at the Care Center show signs of illness from the haze. Many staff members have taken the precaution of wearing surgical masks to protect their lungs from the smoke. The trees in the dry ground section of the release forest look as though they might have been burned but they are just dry from lack of water. Areas of the ground are watered each second day to ensure some trees survive and to return some moisture to the soil. Even the swamp forest is much drier than it has been in past dry seasons. The leaves now crunch underfoot where previously they would have been sucked down into the mud. The wells at many of our OCCQ facilities have run dry which makes it very difficult to clean orangutan sleeping enclosures. The ground at the OCCQ has become dry and almost brittle and the staff wear face masks to prevent inhaling the smoke. Please consider donating extra this month to support the OCCQ facilities during this fire emergency. 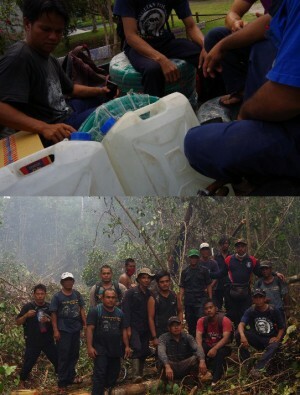 Share the news about fires in Kalimantan (Borneo) and elsewhere in Indonesia and encourage your family, friends, and coworkers to support OFI Canada projects affected by the fires. 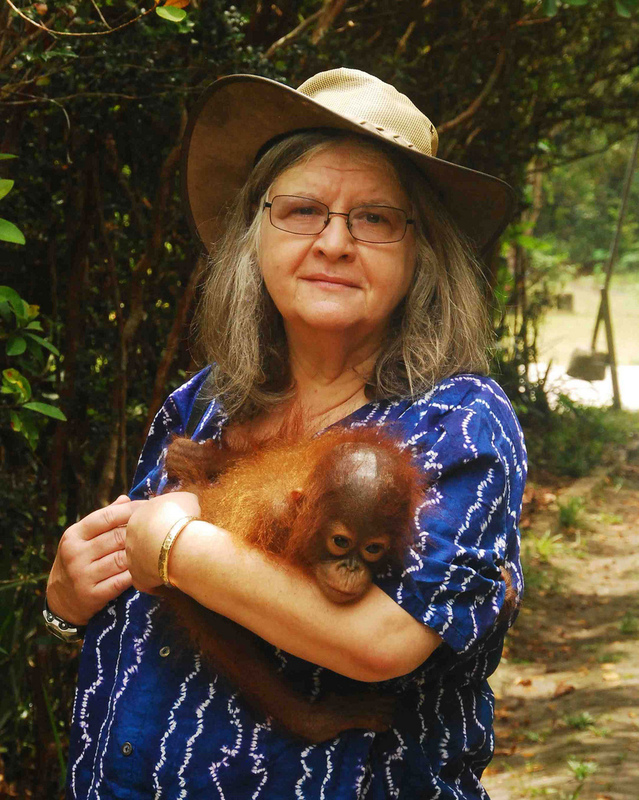 Yet life goes on as the orangutans must eat, drink, and go into the forest daily. Our staff still comes to work and those out fire-fighting often work until after dark. Therefore, the support offered to the OCCQ through OFI Canada is even more important during this time. Operations in the field at the OCCQ must continue and must be paid for even as expenses sky-rocket due to the fire-fighting efforts. The fires we are fighting are considered the worst in decades.